The Boeing 767-300 was the inevitable stretch of the shorter series 200. Announced in 1983 the series 300 was a simple stretch whilst the 300ER provided a major range boost too. Initial sales were a little slow but in the late 1980s the 767-300 and 300ER became the default replacements for large fleets of DC-10s and Tristars especially with the US majors and Japanese airlines. The series 300F launched in 1993 kept the line going strong well into the 2000s even after the A330 had come to dominate this portion of the market. Delays with the 787 has seen 767 passenger aircraft continue to trickle off the line as stopgaps (especially with All Nippon) and the 300F continues to receive orders from the main package freight companies - FedEx and UPS. The series 300 and its variants accounts for about 2/3 of all 767s sold with 104 767-300s, 583 767-300ERs and 122 767-300Fs delivered with 70 of the latter still on order. For an aircraft that has frequently been out of the spotlight the 767 has proven an excellent workhorse and money maker. The Dragon 767-300 was released at about the same time as their series 200 and like its brother remains one of Dragon's best efforts. Much of what I said about the 200 is true with the 300 and this 767 still stands up to modern scrutiny as long as you don't mind the usual Dragon weakpoints - undercarriage, plastic wings and tail attachment. Having said that in this mould the undercarriage is actually pretty decent. Even so the Dragon series 300's nose just isn't as good as the 200. It often seems too chunky and round (a bit Snoopyish) but then again Dragon's poor cockpit windows sometimes are a factor in causing this look. I certainly don't recommend Dragon's 300s like I do the 200s but am still happy to own the mould. Ironically I think a lot of the older models look better than the newer versions. Gemini's 767-300 appeared just before their series 200 and again as you'd expect they share much the same pedigree, meaning it's an excellent moulding, albeit one with a seam around the wing/fuselage fairing. The vertical stabiliser is part of the fuselage on this mould so there are no join gaps like with the Dragon. For some reason the series 300 doesn't seem to have the same nosegear ground touching issues that the series 200 mould does. You should also be aware that many of the earliest versions (like the BA, TWA and Aeromexico below) have the classic original Gemini horizontal stabiliser seam on them. This was modified on later models. This version of the mould never featured rolling gears. Between 2001 and 2009 they produced 35 models and Schuco put out 3 clones. Now I must say here that Gemini's usage of the 767 has been bizarre. They started with this mould but then in 2004/05 for 10 releases used the Phoenix 1 mould below and then reverted back to this mould. Even worse they did something similar again later on with the modified version of this mould - read on. This mould has been used by several companies or brand names (Big Bird, Blue Angle and Aeroclassics) however I think it was originally owned by Witty Wings. It compares favourably to the Gemini and the first Phoenix mould and the main way to tell them apart easily is the landing gear. In fact the nose on this mould is probably the best of the three. On this mould the nosegear especially is quite slight and the tyres appear too small. It's not a major issue by any means but the models do seem a little low to the ground. Quite a lot of models were produced using this mould, though most of them are hard to find nowadays. It ceased production in 2008 about the same time Witty came out with a seamless mould. Everyone has to start somewhere and Phoenix released its very first 1/400 scale models on a 767-300 mould. It actually looks a lot like the Gemini but the initial versions (Skymark below) had a rather pointy nose. The undercarriage was also less detailed than the Gemini and the wing/fuselage fairing join more pointed at the front. Later versions, like the Varig below, look excellent and are hard to distinguish from the original Gemini. As I said earlier however Gemini actually did use this mould themselves 10 times. I don't know why but perhaps it was whilst they fixed up the horizontal stabiliser seam on their own mould. Either way in 2008 Phoenix replaced this mould anyway. This mould does however sometimes exhibit a tendency for the nosegear to not touch the ground, much like the Gemini 767-200. I almost forget about Herpa, but they do slip out the odd model and must spend far too much money making moulds they barely use. It seems they recoup some of this by mould sharing with Hogan who themselves really produce very little and when they do it's for the Japanese market. This mould actually doesn't look that bad compared to some of their stuff, however it does appear more like a 767-400 to me than a 300. I'm not sure it actually is too long but the apparent shortness of the undercarriage makes it seem so. Hogan have continued to slip out rare releases but let's face it - I imagine few people own them. By the time this mould had come out whatever relationship Aeroclassics had had with Witty had broken down so this new seamless version of the original Witty mould was never made for any Aeroclassics releases. Instead models where released under the Aviation 400 and Witty Wings brands. 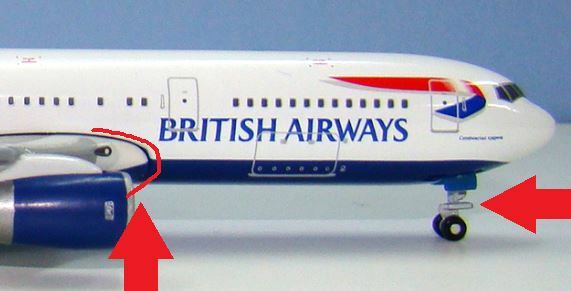 It is basically exactly the same as the first mould except there is no seam around the wing/fuselage joint. It has all the other features of the original mould (i.e. no rolling gears) and when Witty ended production it slipped into oblivion as have most of their moulds. Rather than just mend the seam as Witty did with their mould Phoenix produced a completely different 767-300 mould complete with rolling gears. Later versions also come with antennas and there is a wingletted version as well. In fact as described below Gemini actually used the wingletted version for about 5 years before they had a wingletted version of their own. I think this mould is fine, although in removing the seam Phoenix have also removed most of the quite visible real bulge which the seam used to denote. The aircraft thus looks a little slab sided ahead of the wing itself. The tyres are also a little too big (as is common with new Phoenix stuff), but it is not a major problem like on the 757. Everything else looks good to me. JC Wings updated Gemini's original mould with rolling gears in 2009 however it wasn't until 2015 that they added aerials and produced a version which also had winglets on it. JC Wings began using this mould from 2009 with Gemini starting in 2010. But Gemini were at it again and between 2011 and 2015 they actually used a different mould (Phoenix 2) if they needed to release a 767-300 with winglets. This means if you're getting a Gemini 767-300 from both the early 2000s or early 2010s it doesn't necessarily mean its using this mould lineage. 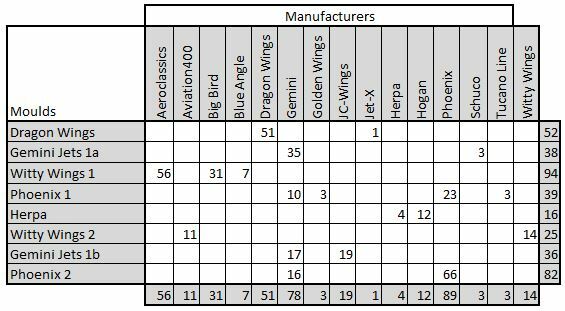 Gemini used the Phoenix mould for wingletted 767s from 2011-2015. Note the lack of a seamed wing joint. The 767-300 is well covered in 1/400 scale and even better all the moulds are actually fine. In fact it the type that I own the most different moulds for and I don't particularly feel the need to standardise on one to the detriment of the others. Neither should you.